It forms potentially explosive mixtures with water. When mixed with water, it generates toxic gases, vapors, or fumes in a quantity sufficient to present a danger to human health or to the environment. It is a cyanide- or sulfide-bearing waste that, when exposed to pH conditions between 2 and 12.5, can generate toxic gases, vapors, or fumes in a quantity sufficient to present a danger to human health or to the environment. It is capable of detonation or explosive reaction when it is subjected to a strong initiating source or if heated under confinement. It is readily capable of detonation or explosive decomposition or reaction at standard temperature and pressure. It is a known forbidden substance or a class A or B explosive. It is a material that contains or degrades into toxic components in concentrations that poses a potential hazard to the environment or to the public health and that may be fatal to humans in low doses. 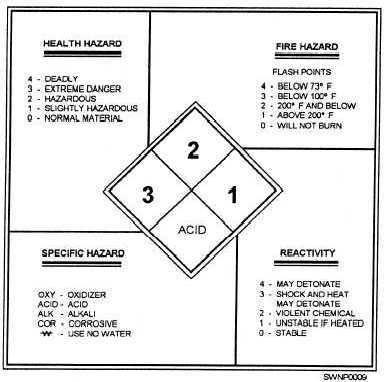 To determine specific hazards at a glance, refer to the warning markings and labels that identify hazardous materials. Hazardous warning markings and labels are necessary to show clearly the hazardous nature of the contents of packages or containers at all stages of storage, handling, use, and disposal. When unit packages (marked packages that are part of a larger container) are removed from shipping containers, the continuity of the specific hazard warning must be preserved. This is normally done by applying the appropriate identifying hazardous label to the hazardous material container or package. Figure 1-7. - Hazardous Code Chart.